At Berven Chiropractic we love when patients share with us their feedback and comments after chiropractic care. Please read our patient testimonials below to see what other people have achieved through their tailored treatment plans with us. Share your stories too! Click here to send us your feedback so that we can help to spread the word about the benefits of natural Berven Chiropractic care. Like so many. I went to Dr. Berven because of severe pain, especially pain in my neck. It was the kind of pain that at times can be life-altering. I went to several doctors who could not really help me. After just a few visits with Dr. Berven. I started feeling better. Eventually, I got to the point where I was pain free for long periods of time. I attribute that to the adjustments I received and to following other directives provided by Dr. Berven. Based on experience. how has your health improved? I had never been to a chiropractor before Dr. Berven; I had no idea of the benefits that chiropractic medicine could provide. There are the obvious benefits that come from pain reduction like sleeping better, moving with greater ease and an overall improved attitude. Dr. Berven actually helped me to change my attitude about managing my pain; she helped me to lose weight and to be able relax more. Dr. Berven has helped me to move in a better direction in managing my general health and well-being. What have you tried before that didn’t work? I had tried several prescription drugs. physical therapy. all kinds of back braces and pain-relief paraphernalia. I had several epidurals to deaden the pain and even resorted to radio frequency ablations to burn the nerve endings. Most of these were not pleasant procedures and to no avail. What would you say to someone who is considering Chiropractic? I would definitely encourage him/her to try it. I would emphasize the overall benefits of chiropractic care. But. I would particularly emphasize the unmatched brand of care that Dr. Berven delivers. Dr. Berven not only brings expertise and a wealth of experience spanning many years, but she also brings real compassionate care. The quality of her sensitivity to patients and their needs is rare in healthcare today. at least in my experience. Dr. Berven has an extraordinary ability to listen and discern what the patient’s needs are before proceeding with any kind of treatment. Her demeanor and obvious concern for the patient’s well-being are in themselves part of the healing process. I was bothered for years with knee, back and neck pain. 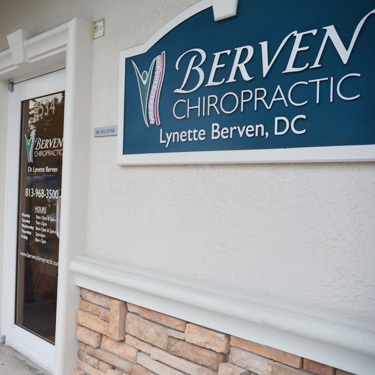 I found that if Dr. Berven adjusts me on a regular basis it gives me some relief. I have chronic health problems that require regular adjustments by Dr. Berven. I would have to say that my dizziness, flexibility and pain has improved. I have made countless trips to medical doctors for treatment. Their solution to the problem was a prescription for pain medication which I couldn’t take because of my drug sensibility and IBS. I would recommend that they find a chiropractor that they feel comfortable with . I feel that Dr. Berven is compassionate and caring toward her patients. I would highly recommend her if you need treatment. The nerve pain in my legs disappeared and I no longer threw my back out. I am more mobile and able to work out at a higher intensity. Physical therapy…and surgery if that did not work. It works. I was a skeptic prior to seeing Dr. Berven. I suffered unnecessarily for years with nerve pain and would consistently throw my back out. Since I began seeing Dr. Berven, I have not thrown my back out and the nerve pain is non-existent. I have less pain and more flexibility. I am no longer taking lots of medicine for pain. I am a Registered Nurse and a firm believer in chiropractic medicine/treatment. I don’t have to take medication for pain relief. Also, that if I’m in pain, I usually get relief immediately or within 24 hours. Again, want to stress for me, no medications. I think the improvement is you don’t always have to take medications or surgery to fix something. She has adjusted my knee so well that I did not have to have surgery or PT. Also, I get bad migraines. She adjusts me and it is gone immediately. You should try it for 4 to 6 sessions. Dr. B.’s very aware of pain levels and will not by aggressive. She will move at your pain level and take time to move your bones gently. She is wonderful; The best. Dr. Berven’s office is centrally located and her office hours are ample to be able to schedule appointments. Because Dr. Berven and Lisa, the office manager, know their patients so well they can work you into their schedule if needed. The biggest benefit is that Dr. Berven and Lisa want to take care of their patients’ individual needs. They care and want to help you feel better! They are kind and their office is calm and runs smoothly and efficiently. Thank you Dr. Berven and Lisa for taking care of me – and my family! Yes! Dr. Berven is a caring chiropractor who changes her course of action (manipulations) to gain positive forward healing. She asks pertinent questions prior to and during the exam to determine the course of action – which determines better healing processes. We have seen other chiropractors in the past. Because Dr. Berven offers multiple way s to work a muscle (EMS, rapid release machine and in-house massage therapist is available) this adds to the healing process of our injuries or helping our body heal and maintain. Please – go see Dr. Berven! She cares about her patients and treating them! Dr. Berven takes time to assess your needs and will change her course of action/treatment based on your specific needs. Dr. Berven is thoughtful, calm and caring.